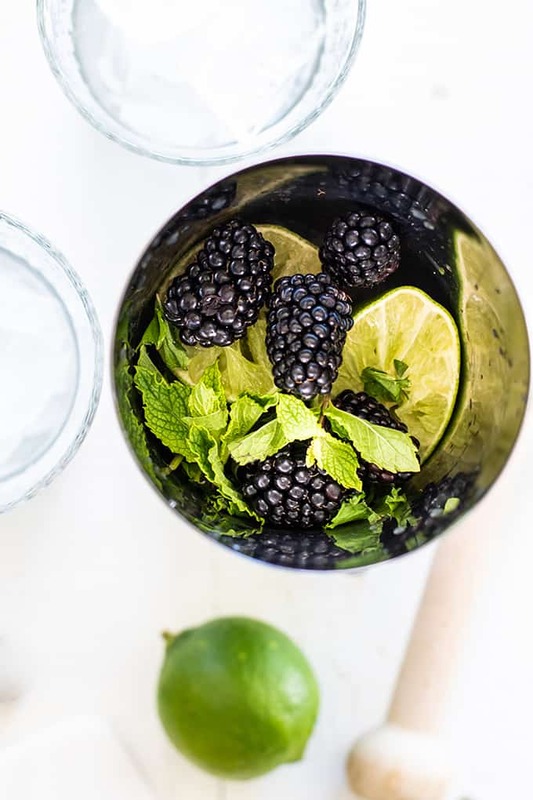 Learn to make the best blackberry mojito, using fresh fruit and mint. Mojitos are the perfect refreshing cocktail on hot days — these can be made with no sugar at all, but I’ve also included some healthier sweetener options! 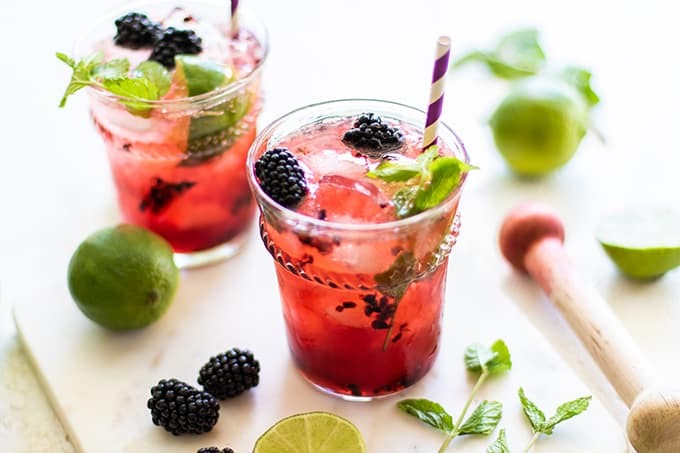 Summer is for fruity, refreshing cocktails — and they don’t get much better than these healthier blackberry mojitos. Refreshing lime and mint flavors. Customizable — I adore this blackberry version, but watermelon, mango and raspberry are amazing also! No blender required = less clean up when you’re already tipsy! Anyone can make a mojito! No mixology experience necessary. Fresh mint (oh so cooling!). Rum. Or gin. Or tequila. Pretty much whatever liquor you have on hand or love to imbibe in! It also helps to have a muddler. A muddler is just a stick with a rounded end that is made to crush things like lime and mint to release their flavors. If you don’t have one, you can certainly find something else to use — the one pictured here is actually not a real muddler, but a tool use for pressing tart dough into a pan — no need to buy a new tool when the mojitos only come out a few times a year at my house! How do you make a mojito with Vodka? 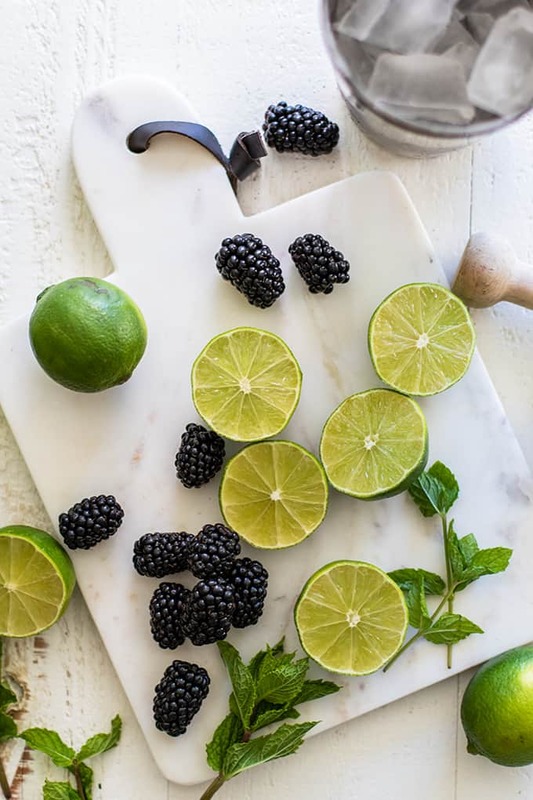 Vodka: A blackberry mojito can easily be made with vodka by just changing out the rum in the same amount. 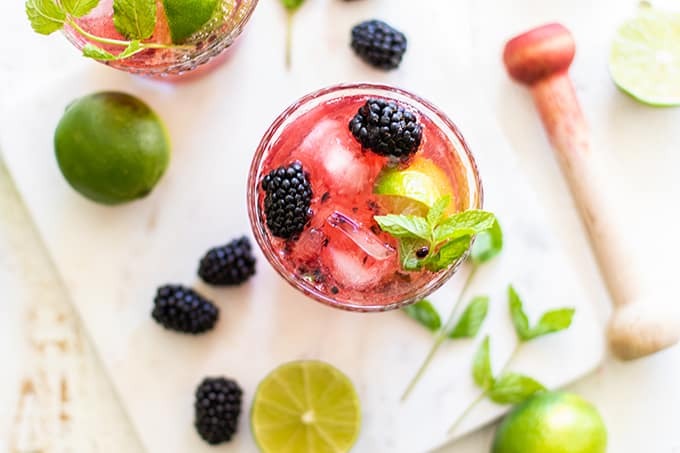 Tequila: Turn this in to a blackberry margarita by swapping the rum for tequila and adding a few tablespoons of orange juice. Virgin: Omit the alcohol altogether, and have a fun mocktail to serve to kids. If making these for kids, you might want to double up on the sweetener. These drinks do not need added sweetener if your blackberries are sweet enough! I like the tart flavor in lime in my drinks, so I adore these without any sugar. Date Syrup: This is my favorite sweetener. It has an almost neutral flavor, so it’s perfect for naturally boosting sweetness without changing the flavor of your recipe. Raw Honey: Buy a lighter colored honey for the lightest taste. Stevia or Monkfruit Sweetener: These are a healthy low carb cocktail if you opt to not sweeten them, or choose a noncaloric sweetener. 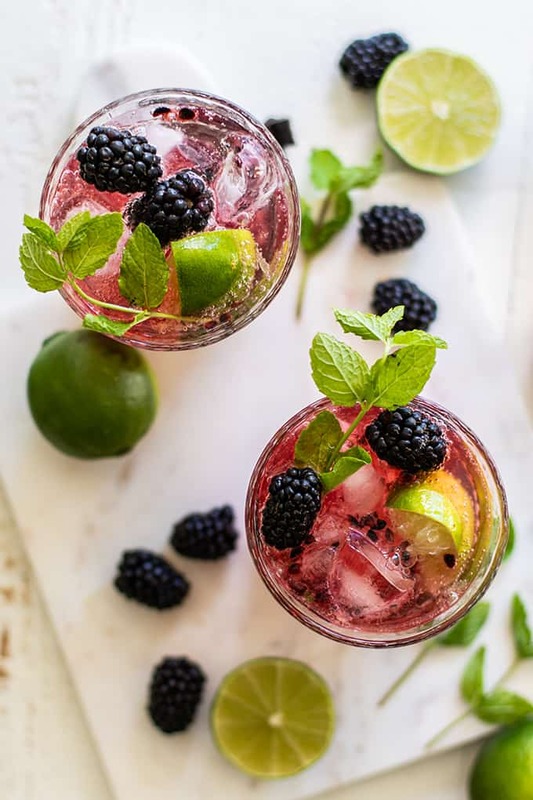 These healthier cocktails are bursting with summer flavors -- sweet blackberries, fresh mint, and tart lime. Top these up with soda water or a sparkling lime flavored mineral water. For the best mojito, keep your alcohol chilled so it doesn't dilute your soda water. Add a few ice cubes to a cocktail shaker or large sturdy glass. On top of the ice, squeeze the limes, and then add the limes to the shaker. Also add blackberries, mint, and date syrup. Use a muddler to crush the mint and blackberries. Add the chilled rum, and continue to muddle until the mint and berries are well crushed. Pour the mixture into two glasses, including pieces of the crushed berries and mint. Add extra ice, and then top with soda water. 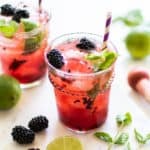 This Blackberry Mojito post may contain affiliate links, meaning if you make a purchase, I will receive part of the sale as a comission. This helps me continue to bring you lots of fresh and inspired recipes! This mojito looks amazing! Mojito is my favorite cocktail. I'm excited to try the date syrup. Thanks Mira! Mine as well -- so light and refreshing! These mojitos look amazing! Love that they are so versatile. Thanks Karly! I love fresh fruit in my cocktails.